I'm so glad tomorrow is Friday! This has been the longest week EVER. Mostly because I'm all caught up at work so all there is to do is work on changing some old files over to some new folders which is beyond mind numbing. I listen to Podcasts while I do it usually but I'm all caught up on those too! Last week I was in Davis all week for a new employee training. Which is funny since I've been a contract employee for 9 1/2 years. What's even funnier is that we took field trips to places I've already been and stopped for people to buy souvenirs in Lodi, which is where I graduated High School. There was only about five people there from California, the rest were mostly from North Dakota, one from Montana (she was a lot of fun! ), two from Florida, one from Washington State and one from ALASKA! So really I was kind of the minority for a few things. One being I was over the age of 30, a woman, and from the area. Also my co-worker and I had JUST went to another week long (well 4 days) training 2 weeks earlier in you guessed it, Davis (and even in the same room). The first training we went to was called Managing for Excellence and was kind of about personalities and how to get along with others and "manage" people. 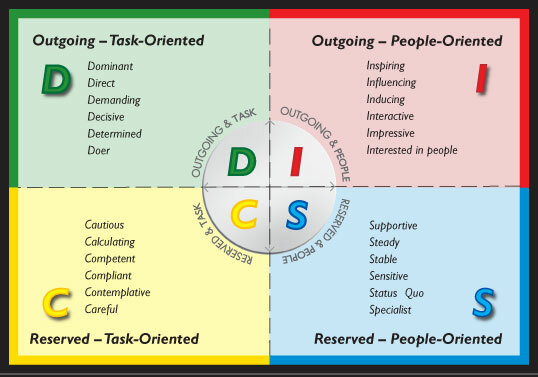 We did this little test thing to find out what kind of personality we were and I was a "Dominant" personality. Go figure haha. My 2nd highest was the "C" which is a lot of me too. What was funny about this training was that there was like 5 of us that had the same job position and all but one were Dominant. Goes to show what works best in that position, eh? So back to last week's "New Employee" training. The training started at 12:30 on Monday so Justin and I drove up after working for a couple hours in the office. We had lunch and then went into the meeting room. They had name signs on the tables so we had to sit in our assigned seats. Kind of a bummer but it did make you talk to the people around you all week. The guy to my left was named Howard and he was a young (31), and yes I knew most people's ages by the time we left, guy who I just know is going to make something of himself some day. He was talking about going to law school so he could get paid more money for stuff he's already learning about. The guy on my right was really quiet and I actually never did talk to him much. He was a newly wed (26 or 28) and had a new house and lots of toys. The only time I really connected to him at all was when we had to do activity where I was blind folded and he had to tell me what to do. Then it was back to being quiet at the table. After the first day which was learning about who the agency got started (The Dust Bowl-we watched a video from PBS that I've actually seen before but was more interesting now) we were free to go to the hotel. This training was a lot better than the last one because everyone made an effort to hang out together. We were quiet a bit away from where we stayed last time so everyone was coordinating driving the vans that we could use and who wanted to go where. Then a bunch of us jumped in some vans and they drove towards Old Sacramento. We were not the lead car so I couldn't give any input but they ended up parking in a garage. Everyone started walking away from Old Sac and I was like um do you guys know where you are going because there is a lot more stuff OVER THERE. (There's that D trait) Everyone turned around and we walked over to Old Sac and half of us went to Joe's Crab Shack. I was still trying to avoid eating flour items (but not totally gluten free) so I ended up getting this bacon wrapped shrimp that was stuffed with cream cheese and jalapenos. So good! I gave away the hush puppies of course. A lot of people got the buckets of sea food but that was too spendy for me. This was our table, the only group pic I took. After dinner we came back to what was our hang out for most of the week. This long counter like bar that was in the lobby of the hotel (they said it was ok for us to hang out there). I can't remember the guy's name behind the candle thing but he can drink A LOT of beer. The next day we all piled in to the vans and got driven back to the training. I may have wanted to wear my sunglasses inside for a bit..
Well Julie, it was a fun bunch it looked like. I'm an 'I' by the way. We always had a ton of training on this concept and how to work with them, how to sell to them, and what they need to feel comfortable and not pushed, you D's want the control. The D's never read a whole work email - use bullet points especially if a male D.
All the years I had of recurring training in this helped me immensely and I use it now.